On Sunday, reports started swirling that Prince Harry and actor Meghan Markle were dating and that things were already serious between them. Ever since these two have been linked romantically, rumors about Prince Harry and Meghan Markle have been surfacing left and right. Apparently, the alleged duo first met in May in Toronto, Canada, when Harry was promoting the Invictus Games; Markle just happens to film USA's Suits there. And, according to the rumors, they've been seeing each other for around five months and are going strong. Update: In a statement released Nov. 8, Harry confirmed he is dating Markle and defended her against harassment. Earlier: Of course, none of the above has been confirmed or denied. Though, Prince Harry's office at Kensington Palace did release a statement to People saying they don't comment on "private matters." (Bustle has reached out to Markle's rep for comment, but not yet received a response.) Either way, the rumor mill is churning nonstop, so to make it easier to keep track of everything, I've taken it upon myself to gather a handful of the rumors, so anyone who is interested can keep them all straight. I can only imagine that more and more rumors will come about as time goes on, but until then, here is what's being said about Harry and Markle. According to People, Markle has already met Harry's dad, Prince Charles. Per one supposed friend of the prince, "Harry is pretty serious about her and she is pretty serious about him." Another friend added, "It’s great. They have a lot in common and I’m sure they will get on very well." If they are as serious as some are saying, then it would make sense for Harry to introduce her to Prince Charles, but who knows if that is fact or fiction. There may be another royal wedding happening. An insider also told People about a possible engagement, "That is certainly a possibility. It is certainly one possible outcome. It’s pretty serious, so we will see." Though, anyone shipping them shouldn't get too excited or invested just yet, because an alleged "close friend" of Harry's also dished, "People need to let them go their own way and see what happens." Some believe this is solid evidence that Harry and Markle are an item. See that bracelet she is wearing around her wrist? 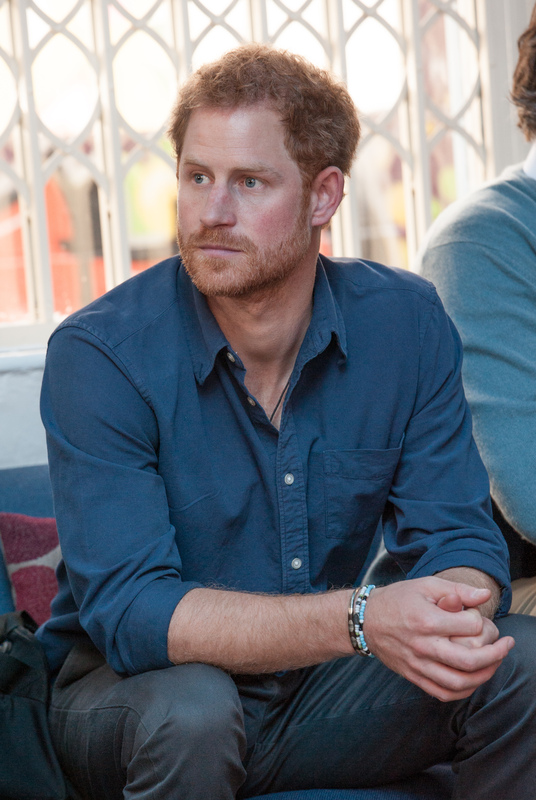 Well, according to The Sun, Prince Harry supposedly wears the same exact one all the time. "It's thought he picked it up on one of his visits to Africa, as he regularly wears bracelets associated with charities he supports," The Sun reports. If you take note of Markle's above Instagram, she captioned it, "#TBT to my solo trip to @sfhmembers #treatyourself #UK #sohohouse #farmhouse." So, she was wearing the bracelet during a trip to the United Kingdom. Maybe he gave it to her then? On the other hand, she could've picked up that bracelet anywhere, especially if it supports a charity. Reportedly, Harry wouldn't stop texting her in the beginning. Per the Daily Mail, "They are the real deal. He definitely pursued her and besieged her with texts until she agreed to a date." Is Markle trying to tell her followers something with these bananas? If you check out the comments, some believe this is her cryptic way of saying, "Yes, I'm dating Prince Harry." Maybe she just likes to draw on her fruit before she eats it? Thanks to his new rumored relationship, it seems that Prince Harry now has to avoid the press even further. The Evening Standard reported that he booked a secret flight to visit Markle in Toronto on Monday, but he didn't show up. "The crew for the British Airways flight knew the Prince was booked to travel with them," a source said. "It appears he pulled out at the last minute and decided not to travel." The Daily Mail reports the reason he skipped out on the flight was due to press and photographers. "And it appears that concerns photographers would be waiting for him in London and Toronto may have scuppered their transatlantic tryst," the Daily Mail suggests. The Daily Star reports that Prince Harry is "besotted". A source also claimed, "He’s happier than he’s been for many years. He’s in a very relaxed period of his life and Meghan has come along at the right time." That said, they are reportedly taking things slow. "They are taking each week as it comes and just enjoying each other’s company but it’s fair to say that they love seeing each other and there’s a definite chemistry between them," the source added. It appears Harry is also being very careful to keep things private. "Harry’s been desperate to keep the relationship quiet – he doesn’t want to scare Meghan off. He knows things will change when their romance is public but he also knows he can’t keep it a secret for long." According to The Express, Markle has already met Prince William and Kate Middleton. "William and Kate really liked her and she fitted in straight away," an insider said. She also seemingly stayed with Harry at Kensington Palace, which is where she met the Duke and Duchess of Cambridge. Basically, they like her just as much as when they met Beyoncé and Jay Z. If these are the rumors so early on in their alleged relationship, imagine what will be said next about Prince Harry and the Suits star.